Mall of Oman is one of a major commercial development project currently under construction in the heart of Muscat down town. The project is being developed by Majid Al Futtaim, a prominent UAE based real estate developer. Mall of will be the biggest mall in Oman. Anticipated to open in 2020, the Mall of Oman will be the largest shopping mall in Oman with unique attractions. Located at Madinat Al Ifran, the new central business hub being developed by Oman near the Muscat International Airport, the Mall of Oman is planned to be the largest retail project of its kind in the sultanate. The Mall of Oman will offer 350 stores across 137,000sqm of gross leasable area including ‘firsts’ such as Oman’s largest snow-park, with an 8,000sqm play area. It will also include the sultanate’s largest VOX cinemas and Magic Planet family entertainment centre, as well as a 12,200sqm Carrefour Hypermarket. 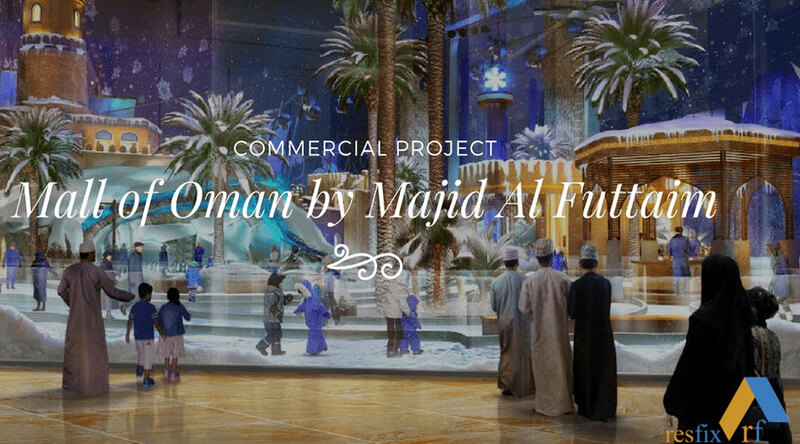 This will be the third mall in Oman for Majid Al Futtami in addition of Muscat and Qurrum City centers. The mall will be constructed through a joint venture between contractors Shapoorji Pallonji Middle East and Consolidated Contractors Company Oman (SP-CCC). The JV was appointed as the main contractor for the project, while initial enabling works – part of phase one of the project – are being carried out by Sarooj Construction, a local Omani firm. In addition to major earthworks and utility diversions, the contract will also entail the construction of road infrastructure, providing major access to site, which is just off the Muscat Expressway.